We’ve been in our new home since March and I’ve been itching to make a few changes. Each time we move my mind starts to imagine all the possibilities and my ‘to do list’ is almost always at least 3 times what is feasible. Reality sinks in and I realize I can’t buy a new sofa, armoire, bedroom set and all the other items I so vividly picture in my head. So, what can I do? Hmm, first of all I can buy pillow covers for my ‘oh so brown‘ sofa. After a trip to IKEA I cross that task off the list. Next, after several moves across the country the green armoire we’ve had since the kids were in their early teens is in dire need of a facelift. Originally used to house the TV it is now used as storage for glassware and linens. 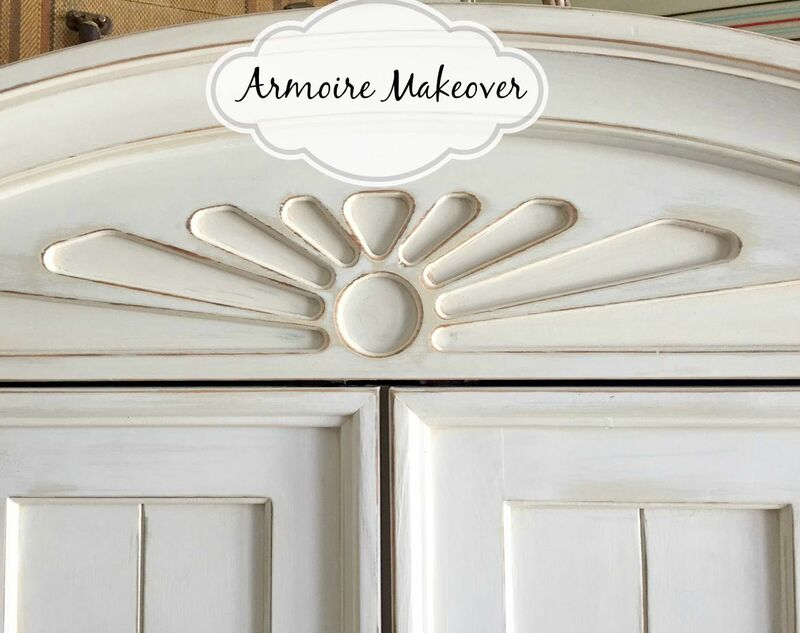 Future plan is to buy a ‘real’ curio cabinet, but for now a new coat of paint on the armoire will have to suffice. 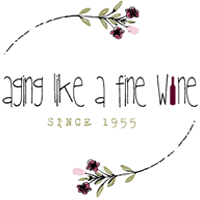 Our son Eric, who has a very good eye for decorating, had purchased Annie Sloan brand chalk paint at an independent specialty store near his home. He used it to transform his drab brown kitchen table and chairs into a fashionable shade of turquoise. The paint went on smooth and did a great job of covering in 1 coat. Since I didn’t have quick access to the same brand of paint I decided to try the Rust-Oleum version of chalk paint sold at Home Depot. They don’t have many colors to choose from so I was limited to only one choice of white called Linen White. It is a very bright white but I had plans to tone it down with a light stain. 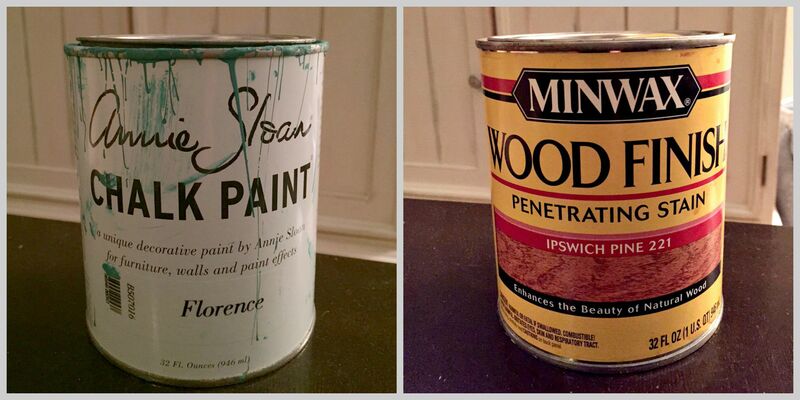 The Rust-Oleum chalk paint did not go on as smooth or cover as thoroughly as the Annie Sloan brand paint. It took 3 coats to cover the green and 2 coats to cover the beige! After the paint had dried, I used a 120 grit sanding block and sand paper to smooth out some noticeable brush strokes and roughen the edges for a distressed look. In some places the previous colors show through adding dimension and character to the distressed finish. Finally, using a brush I applied a Minwax Ipswich Pine stain and sealer, then using a cotton cloth (my husband’s old cut up white t-shirt) I removed the stain. The stain darkens the sanded areas and tones down the bright white. When applying stain it is important to do small sections at a time and wipe off quickly so too much stain does not penetrate the wood. 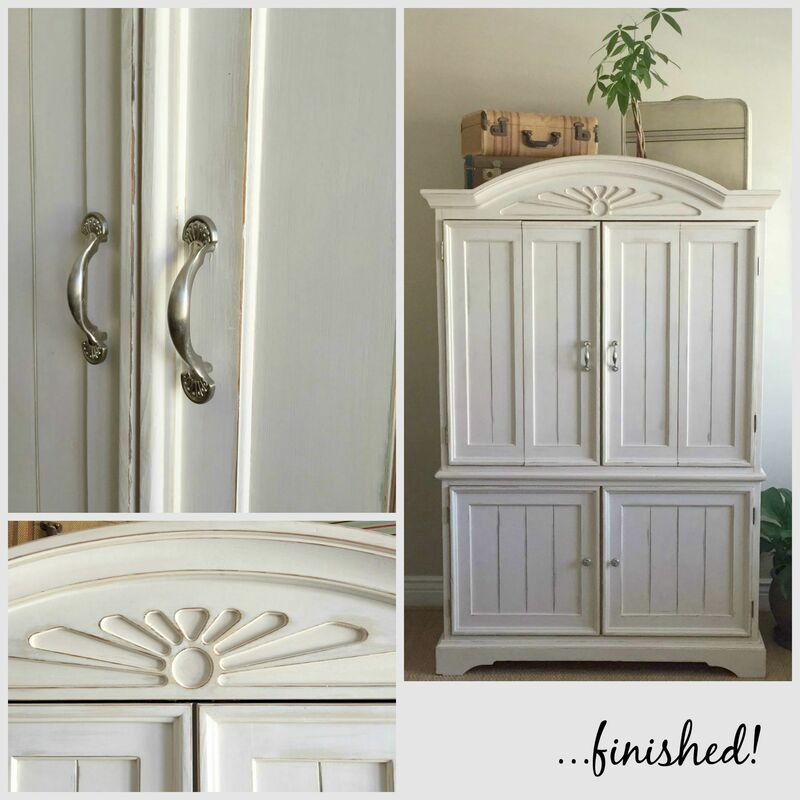 Annie Sloan Brand sells a soft wax that is used as a sealer and protectant that provides a very nice finish. I didn’t use it on the armoire but Eric used it on his table and it added depth and a rich finish to his piece. Eric’s Leftover Turquoise Paint – for my next project! 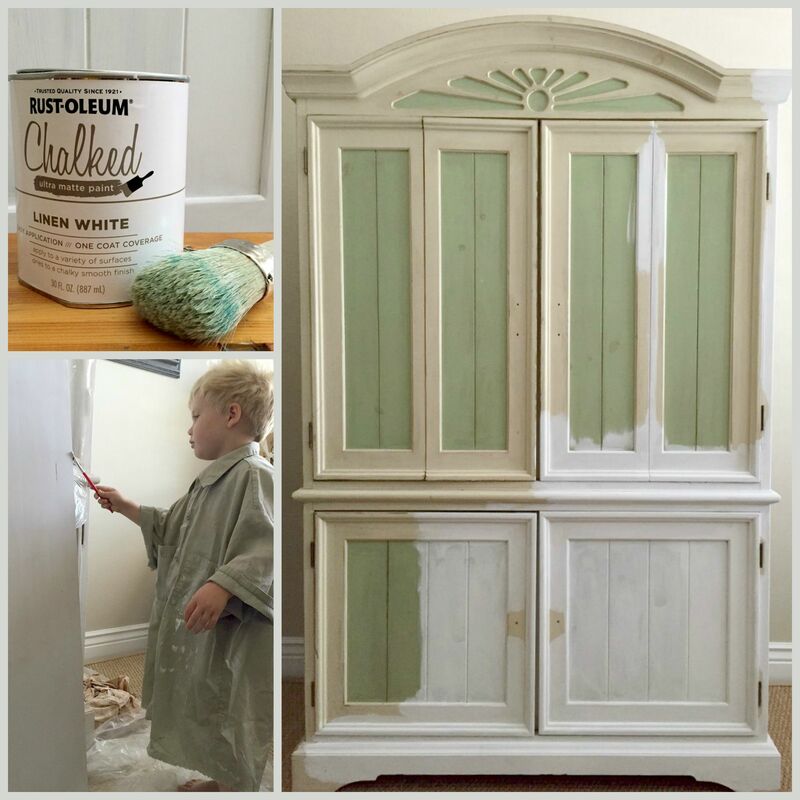 This may sound ridiculous, but I actually felt a little emotional about painting over the green armoire that I had painted so many years ago. I think losing Mia (our mini Australian Shepherd) only a few weeks ago has made me more sensitive about preserving memories. The armoire is just an inanimate object that has no real value. It is the memory of family get togethers, children playing, quarrels and laughter that all happened in the home where the armoire was kept that are important. I never want to forget those.